Wild As The Wind make a beautiful range of hand-crafted, healing bath salts, all of which are infused with medicinal grade essential oils. All our bathing salts are hand blended with some of the most healing and relaxing essential oils available, and are wrapped in lovely natural muslin. *The muslin square is the perfect size for using as an age-defying exfoliating face cloth after you decant your aromatic bath salts into a glass jar. *Between 75% and 98% of essential oils are adulterated, some of which will be rendered toxic at best, and carcinogenic at worst. So, instead of obtaining therapeutic benefits from using these oils, you are potentially damaging your health. Wild As The Wind essential oils are the real deal! How Do Our Bath Salts Compare In Price? How Much Do Wild As The Wind Bath Salts Cost? Storing your essential oil infused salts in a glass jar keeps the bath salts fresh. As essential oils are volatile oils, they will soon disperse into the air if they are not kept in an air-tight container. Bath salts as a gift is not like buying something as personal as a perfume. But, bath salts as a gift is still as considerate and sensitive as buying something like perfume. This is because there’s a choice of bath salts for different personality types, and for different times in our lives… So, buying bath salts as a gift allows you to show the recipient they are seen, heard and understood, and that you care about them. But, buying bath salts as a gift won’t get you into trouble like buying perfume potentially can! We are at the specialist Shaftesbury Cobbles Market every third Saturday of the month (excluding May 2109). Wild As The Wind will be at several of the Friday markets at Bath Green Park Market throughout the summer months. Wild As The Wind has also been known to put in the odd appearance at the Bath Green Park Market, Street Market, Shepton Mallet Market and St Nicholas Market in Bristol. Further details of the markets we serve. We will soon be putting in an appearance in Bath also. Mineral bath salts, particularly those infused with high grade essential oils, like the ones from Wild As The Wind, are extremely curative, deeply relaxing and can help replace the mineral deficiencies in our diets. Each of the three salts used in our bath salt blends, Himalayan Rock Salt, Epsom Salt and Dead Sea Salt all have different healing properties, as do all of the essential oils. Learn more about the healing properties of the Wild As The Wind Bath Salts. The retro hand-printed luggage labels state which bath salts are contained within the muslin. The different essential oils are used individually with each pack of 1kg bath salts (i.e. one oil per 1 x 1kg sack of salts). Read the full list of healing benefits of our bath salts. The beautiful natural muslin packaging has been chosen as it’s the perfect size and texture for using as an exfoliating face cloth. Using a mildly abrasive cloth in the process of removing dead skin cells helps to increase the renewal rate of facial skin cells, which has a very anti-aging effect on the skin. The quicker facial skin cells are renewed the more young-looking we remain. Bath salts are best stored in a glass jar, preferably with a glass lid. Salt can be corrosive to untreated metals, however, pickling jar lids are coated in a protective layer of plastic, so these are also ideal. 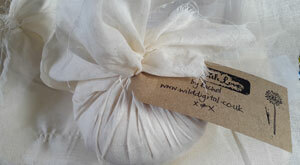 Use your natural muslin for making nut milks or for straining other liquids in the cooking and preserving process. Recycle the 100% degradable plastic bag. Alternatively, use your muslin cloth as an exfoliating face cloth, as directed above. Bath salts can be used to luxuriate, or relax, or for medicinal purposes. The beauty of bath salts is that if you are only using them to indulge yourself they still impart all of their healing benefits to you all the same. It is estimated that the first 20 minutes of a bath, or foot bath, with healing salts, is when the toxins are drawn from the body, with the following 20 minutes of the bath allowing the minerals in the salts to be absorbed. We should bathe for a minimum of 20 minutes in our salt baths, but forty minutes would be optimal. Place 200g of salts (approximately 1/5 of a 1kg bag of bath salts) into a hot bath, and then soak for a minimum of 20 minutes, or for up to an hour. Bathing for approximately 40 minutes, as a minimum, allows the salts sufficient time to be absorbed by your body, and for the detoxifying action of the salts to work effectively. To extract even more healing potential out of your bath salts first mix them with a couple of teaspoons of base oil, like Almond Oil, or Coconut Oil, and add a couple of teaspoons of warm water. Stand in the bath as you start running it and use your bath salt solution to scrub your arms legs and belly. Not only will this improve the condition of your skin to the touch’. but it will also have a positive impact on any cellulite you might have. This would be particularly true if you added a couple of teaspoons of Cellulite Vanishing Oil. Allow the salt to fall into your running bath to dissolve. The feet are extremely absorbent and can deliver healing benefits to all parts of the body very quickly, as with Reflexology. Foot baths can be equally as healing as full body baths, and in some respects they are preferential to immersive baths. It is possible to achieve the 1% salt to 95% water ratio (1:100) for an affordable, environmentally acceptable, and optimally healing salt solution. To truly take advantage of the full range of healing benefits from salt baths, the salt concentration has to be equivalent to, or must exceed, the salt ratio of your body fluids (approximately 1%). Only this will activate the osmotic exchange ratio, allowing optimal levels of toxins to be removed from the body and for the minerals in the salts to be absorbed. This is much easier to achieve in a foot bath than it is in an entirely immersive bath! Note re. Himalayan Rock Salt :: The ferrous element within Himalayan Rock Salt, (which is what makes Himalayan Rock Salt pink), does not completely dissolve. This means a few very pink crystals will remain when everything else has gone into solution. For this reason it is best to place Himalayan Rock Salts at the foot of the bath to ensure you’re not sat on any of these abrasive crystals whilst bathing. Epsom and Dead Sea Salts are not ferrous and so they both dissolve completely. These heavily aromatic bath salts are hand blended and then hand wrapped with love. The label is hand printed and partially hand written before it is tied, by hand, to the bath salts to add the finishing touches. The essential oils that the salts are infused with are of excellent quality. Over 75% of all essential oils being sold as being pure and natural are, in fact, adulterated. This means that they have been manipulated in some way (often in several ways), which can diminish or negate the oils healing properties. in a lot of cases the adulteration actually transforms a lovely healing oil into a toxic glob of nastiness that you don’t want to put anywhere near your skin. Our skin is our largest organ, and things can be absorbed and can easily enter the bloodstream. It is, therefore, important to ensure that you only use health-giving oils in your skin and healthcare regimes. A quick scoot around the internet revealed these over-priced options… none of which are packaged in such a nice way as the Wild As The Wind bath salts. Even though we use the best quality ingredients, and despite the packaging being far superior to the alternatives, we retail 1kg of salts at £7.00 for plain salts, or £8.00 for salts that are infused with a single essential oil.